The Maxim M/32-33 is a Finnish modification of the Russian M1910 Maxim, developed by Aimo Lahti in 1932. The weapon was able to fire at the rate of 850 rounds/min, while the Russian M1910 and earlier Finnish M09-21 were capable of 600 rounds /min. The reason was not only that Aimo Lahti was ordered to develop the weapon with a new metallic ammunition belt but also because of other improvements, such as accelerator mechanism and muzzle booster. Other chnages included the redesign of the Maxim M/32-33's grips and rear sights, as well as an installation point for an optical sight. Unlike all the other Finnish Maxims, the Maxim M/32-33 was designed from the outset to be suitable for anti-aircraft use. The new M/32 tripod was designed and issued with extra parts allowing it to be easily modified as an anti-aircraft mount, and accessories for anti-aircraft shooting were included as standard. The last improvement to the M/32-33 was the addition of a snow-filling cap to the water jacket; this way snow could be used instead of water during winter, so there was no need to carry and take care of 3 kg of coolant water in snowy sub-zero conditions. 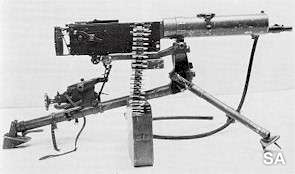 This feature was copied in the late Russian World War II Maxim variant. Some few hundred early M/09s were modified into M/32s by Gun Depot 1 between 1933-1935. These weapons have also been called M/09-32s.